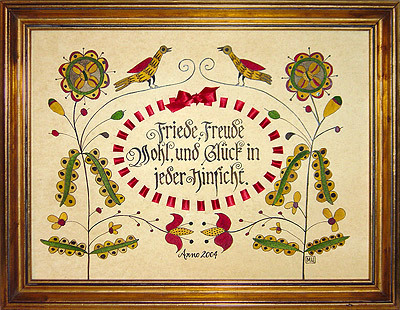 When one thinks of fraktur, most often birth and marriage records come to mind. There were however, other reasons frakturs were created. Valentines, rewards of merit, love letters and holiday wishes encompass a category of work called presentation frakturs. These tender creations were presented from one to another as an intimate gift for someone special. "Peace, joy, health, good fortune on all your ways" is the translation for this presentation piece. Framed in a 9x12" gold leaf frame with conservation glass and acid-free materials.